Is your health suffering from a folic acid deficiency? Folic acid occurs naturally as a complex of related substances called folates, found in sprouts, Brewers' yeast, liver and kidney. However, levels are soon diminished following cooking and processing. And since most of us do not consume enough folate-rich foods, experts believe that many of us are suffering from a folic acid deficiency. Furthermore, studies in healthy human participants show that folic acid is poorly absorbed from the diet anyway, which results in very little of the metabolically active form, methylfolate, being produced. Folic acid undergoes a series of complicated vitamin and energy-dependent changes in your body, between your intestine and liver, before it is converted to its active form, methylfolate. A break in any one of these processes resulting from dietary deficiency, malabsorption and genetic weaknesses can soon lead to low levels of methylfolate in your brain. Now, new research suggests that neurological symptoms such as memory loss, sleep issues, irritability, forgetfulness, and mood issues may result. Neurobiologix specializes in many products that contain forms of Folate, Folinic Acid and 5-Methyltetrahydrofolate. Most often, those that are poor methylators will need additional folate in some form. In the body, the folate molecule goes through several enzymatic steps to become the active molecule 5-MTHF. It is the active 5-MTHF form of folate that participates in the homocysteine-lowering step that results in the production of the safe amino acid, methionine which is essential to cellular function. That’s because in order to make the conversion from folate to the active 5-MTHF, an enzyme called methylenetetrahydrofolate reductase or MTHFR is necessary—and not everyone carries the same genetic version of this important enzyme. It is estimated that between 5 and 10% of the population has a gene variant that reduces MTHFR activity by 70%, while nearly 50% of people of European descent have a genetic variation that decreases MTHFR activity by as much as 35%. If you fall into these categories, you are likely to be a victim of methylation deficiencies that can cause numerous issues with the nervous or immune system. The solution is simple: Instead of relying only on the folic acid in your multinutrient formula, supplement with 5-MTHF. 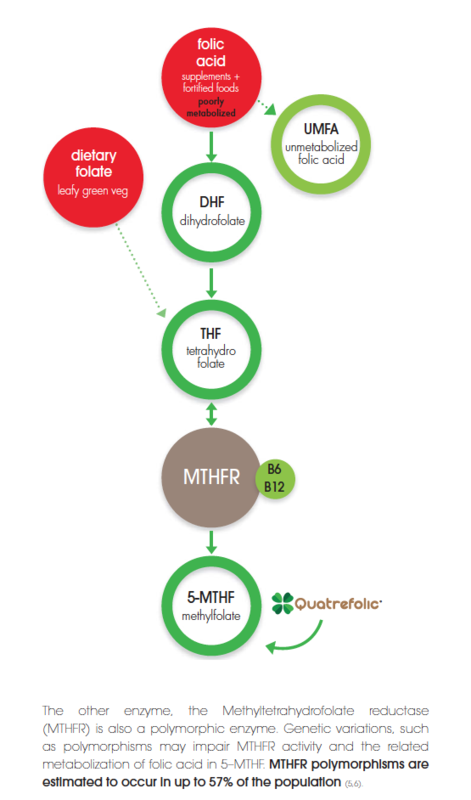 A wealth of laboratory and human studies demonstrate that 5-MTHF is the best form of folate required. The conversion process diagram below guides you through the steps the body must take in order to convert folic acid or folate to the active form 5-Methyltetrahydrofolate which is essential to every cell in the body. At Neurobiologix we start with the active form of folate so your body does not have to go through the process of conversion.